River Walk Dining at Its Best. 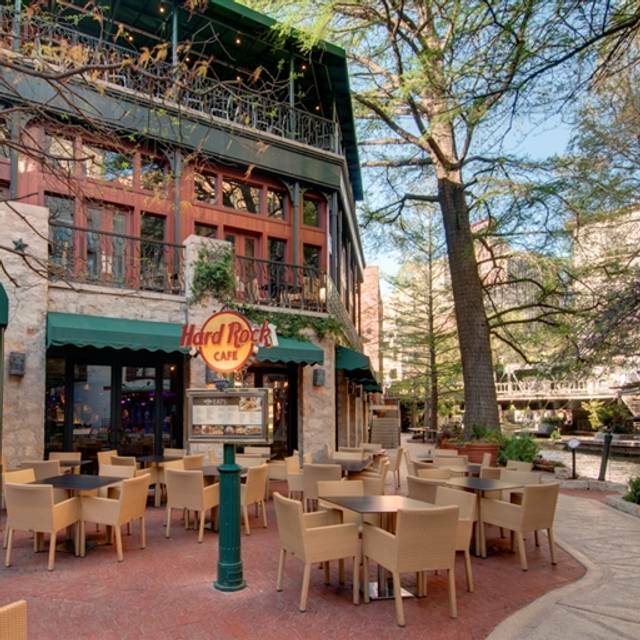 While our outdoor patio certainly offers one of the best dining spots on the River Walk, the inside of our cafe offers spectacular attractions to guests of all ages. Be sure to bring a Texas-sized appetite, as we offer hefty servings of gourmet meals – so huge you can cut 'em with a Bowie knife. Our stylish San Antonio cafe is also the perfect space for a large event, as we have room for 600 guests. 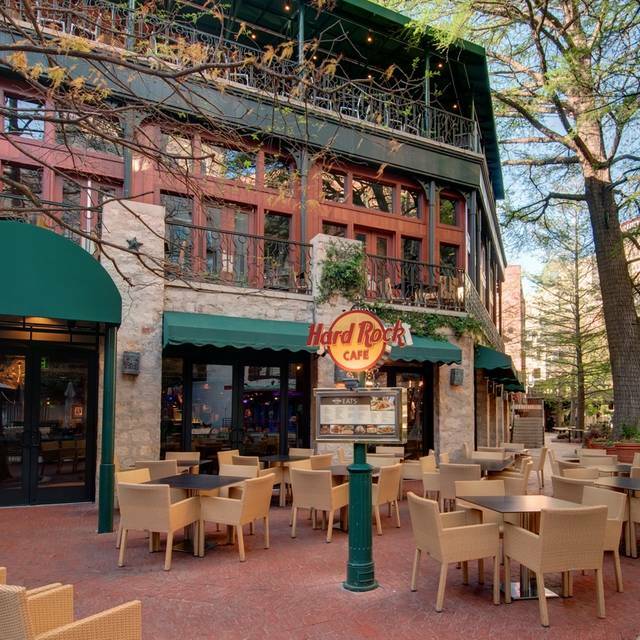 “Remember the Hard Rock!” While we've never been under siege like Davy Crockett and his men at the Alamo, we at the Hard Rock Cafe San Antonio always strive to be memorable here in Texas. 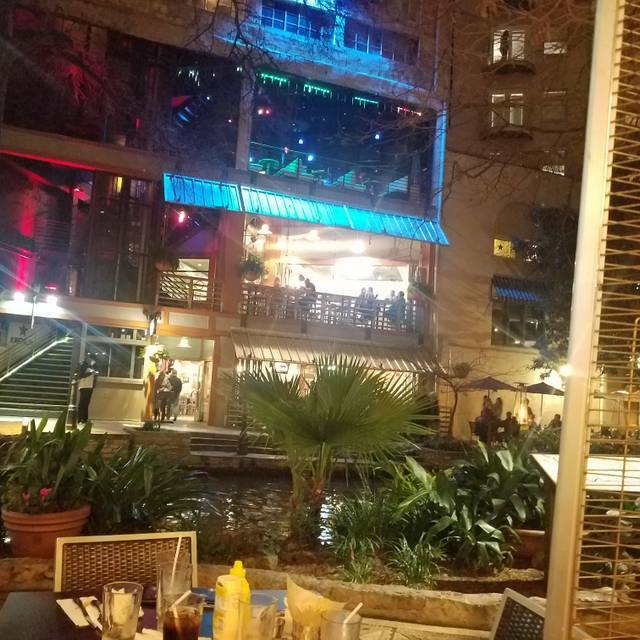 Situated along the city's famous River Walk, the number one tourist destination in Texas, our San Antonio cafe has three floors of patios where you can relax and enjoy the great Texas weather and picturesque views of the San Antonio River with its slow-moving tourist boats. 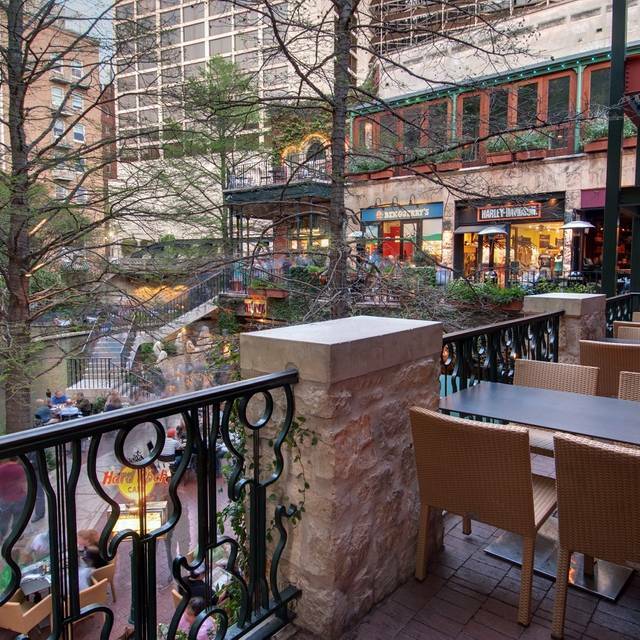 While our outdoor patio certainly offers one of the best spots to dine on the River Walk, inside our cafe is an attraction all its own. Be sure to bring a Texas-sized appetite, as we offer gourmet meals in hefty servings – so huge you can cut 'em with a Bowie knife. Our stylish San Antonio You’ll dine surrounded by a collection of music memorabilia that is big enough to fill a Spanish mission. Join us on Easter Sunday for Blues Breakfast with the Bunny! There will be a live acoustic blues artist performing on our Street-Level stage, photo opportunities with the bunny, drink specials and delicious breakfast buffet from 10 AM - 1 PM. 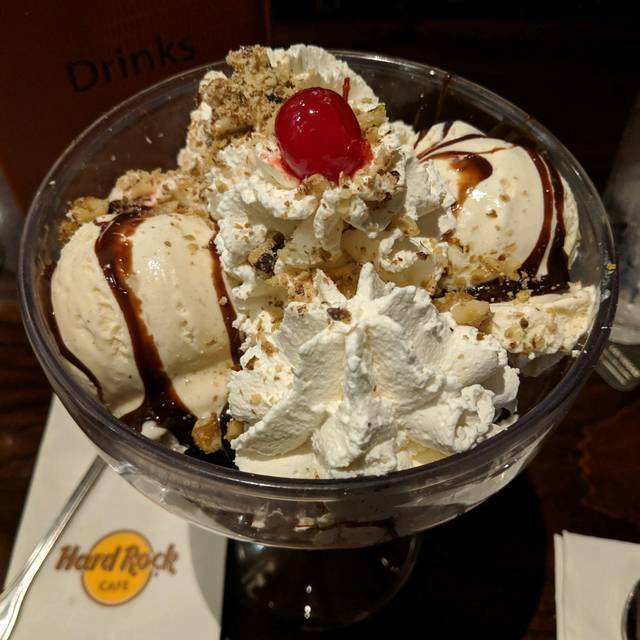 Price is $18.95 for Adults and $12.95 for kids ages 3-11.
it is always reassuring when a brand name, such as Hard Rock Café, maintains its level of excellence- which was the case in San Antonio. Although they had a small problem in honoring our reservation, it was quickly resolved. The food was quite tasty with excellent presentation. The ribs, salmon and flatbread were exceptional. Our desert, cheesecake, was rich, decadent and quite 'yummy.' Our wait-person, Jen, was exceptional, personable and quite the ambassador for the restaurant. All in all a great experience. You are the best and than you for the great review Travelling Person!! Travel back again. Service was very poor as was the food. Was not impressed. Great location with tables outside! Nice staff! Food great as way! Appreciate you visiting us Cristiano!! Great atmosphere. Very good service. It as a very good experience. Thank you John! Please come back!! I enjoy Hard Rock cafe. This was our daughter's 16th birthday party request (we had 10 teenagers). I think the waitress did a phenomenal job considering they sat us alongside two other large parties and I watched her take care of about 90% of everything on her own. She ran her a$ off! That said, we needed to exercise patience a few times, which we were happy to do as we literally watched beads of sweat accumulate on this poor girl's forehead. The place was loud and bustling, which is also expected for a Saturday night on the Riverwalk. The food is what you would expect from a place like this. All in all, we had a good experience and will certainly be back. My daughter enjoys this place. Happy bday to your daughter John and thank you for choosing us!! The food was amazing and the service was great our visit was awesome. Glad you enjoyed your visit with us Luz! We had a mom’s night out and were treated very well. The drinks and appetizers were amazing. Thank you for your hospitality. You are the best Maryalice!! Thank you and glad all you Mom's had a great night. Thank you Jasna for choosing us. Awesome service and great food! Nice for handicapped as well!!!! It was good all in all. Just super busy at the time. Glad your visit was great. Thank you Courtney. Jen was GREAT! Place is BUSY! Would go back just because of Jen! She had a sense of humor even though she was busy. Jen is the best and glad you had a great experience. Reserving with Open Table was great. The hostess and our waitress were great as well. Was expecting more from a meal that set this middle class family back 80 bucks though. The flatbread appetizer was delicious, but my husband’s $18 impossible burger was messy and had old lettuce in it. The patty was great, but he had soggy bread and one piece of old lettuce. Kid’s liked their shakes and pizza, but I asked for no seasoning on the broccoli and it ended up being too spicy for them due to too much pepper. Steak was overcooked, sent it back and it was the same steak but even more overcooked. Server was overworked but was awesome. The cauliflower buffalo wings were the amazing. We have to check in with the hostess twice. Apparently she didn’t hear me say I preferred a booth when asked because the lady that went to seat us seem a little put out when she took us to a table and I requested a booth. You were out of the purée needed to make the drink I requested so I had to order something different and I’m guessing the waitress didn’t hear me ask for water when we ordered our drinks cause I had to ask a few times. my husband had to eat his burger with a fork because it wasn’t put together very well. My burger just tasted plain I ended up having to drown in it ketchup to be able to finish it. The thing is this was suppose to be our visit to give you a second chance but our experience was worse this time and gift card or no gift card I don’t care to return. Had a great meal at HRC! Would definitely go again. I recommend making a reservation. There’s no waiting. They sat us immediately. You rock Cindi! Thank you. Too many birds and duck dive bombing over and service seemed to be off. Received dirty plates without appetizers, no straw for cocktails and no spoons with desserts. We eat at hard rocks worldwide so we will leave it at an off day for them. Disappointing since it was St. Patrick’s Day and they were on the riverwalk. Thank you for choosing us Renee and I do hope you will visit soon again as I know we can provide you a better experience and exceed your expectations. Went for my anniversary and loved it! The only reason it was loud was because it was st Patrick’s day weekend and we sat outside. El ambiente padrismo! Nuestra mesera un poco rara, las bebidas riquísimas, la comida necesita que se haga con más amor! Thank you for your business. We hope you will come back again and visit. Great service, food and atmosphere! Great friendly Service, Seated right away, drinks were great & food was awesome! Great Time ! Love San Antonio! Will be Back! Thank you for the great rating Susan. Great restaurant to go eat at. Beautiful scenery. Live atmosphere. Thank you James! Please visit us again. Server was non-existent. Food taste and quality was average. Not something I’d avoid in the future, but definitely not something I’d seek out, or go out of my way to eat at again. My daughter and I had a great time. Service was great food was good. Could have been a little warmer. But considering the had a lot of business on Spring Break they did a great job! We will definitely be back there may be have to be at the Dallas location. I am glad you and your daughter had a great time Annette! Thank you. St. Patty’s shakes and burgers were delicious and service was remarkable! Thank you very much for the great rating. Glad you liked our St Patty shakes! Impeccable service, delectable food, and inviting environment. Definitely would go back. You are the best Mackenzie! Server was not polite and did not return to provide refills or check the table often. We went without drinks for over 20 minutes. Food was alright, at best. The appetizer I ordered took the longest to come out, and was incorrect so it was sent back along with a burger my daughter ordered. We got the appetizer back, but didn't get the burger back until the end of the meal. I blame the lack of attention on the server's part. We asked for drinks to go and the server tossed them onto the table at us. We spoke with the manager and he took care of us. He was the best part of the visit. I would go back just because he assured us he would take care of the problem! You are amazing Catherine. Come back and see us. Fun place to have dinner, kid friendly, friendly waitress. You are the best Vanessa! Thank you. Made a reservation early in the day and by the time we got there right at our reservation time our table was already ready and I was surprised they didn’t give it away because it was so busy. Food got out fast and it was soooo good! And our waitress was awesome!! Definitely will go back! Thank you Madison! Hope to see you again soon. Thank you for choosing us Rantam! Please come back again. Our appetizer included chicken strips and when my fiancé bit into it he said he almost felt like he cracked his tooth on a big chunk of bone. Then after the server charged us for our meal, I looked at the receipt and was charged for two drinks when I received water. My fiancé got an ice tea. Overcharged and server really didn’t care. Great atmosphere, service and good food! Would definitely recommend visiting. Appreciate you visiting us Paul. The food was delicious and the service was spectacular. 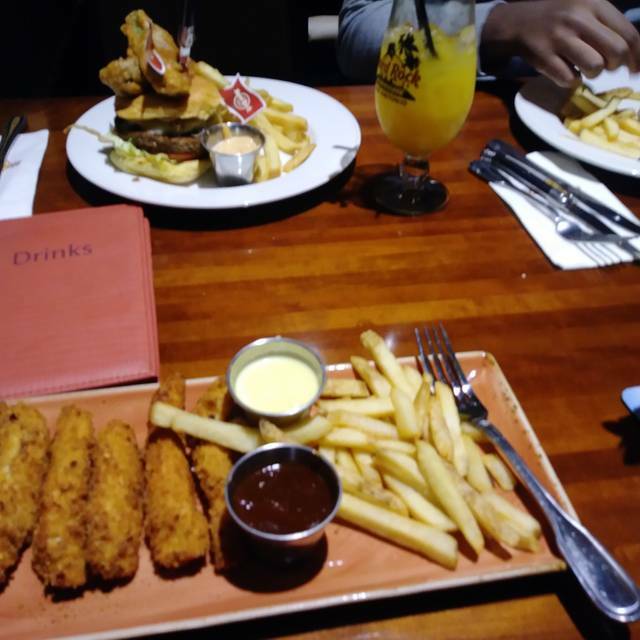 We always have a good meal when we go to a Hard Rock Cafe no matter what city it happens to be in. You are the best Donnie! Thank you for your business. The food has always been overpriced and mediocre... however my waitress and ambience was great. Thank you for choosing us Celia. Please come back.